2017 brought extraordinary summer heat to California. While record-breaking early-season heatwaves largely spared the immediate coastal areas (but brought endless weeks of searing triple-digit heat to interior areas), extreme temperatures extended all the way to the beaches over the past couple of weeks. The late summer and early autumn months are traditionally warmest of the year in coastal California, as the marine layer tends to become suppressed and offshore winds occasionally allow hotter air to encroach from the east. But the late August and early September heatwave that California just endured was on an entirely different level than those historically experienced–breaking (and, in many cases, shattering) temperature records of all kinds. Countless daily (and monthly) temperature records were set statewide, and this heatwave continued the already record-breaking streak of 100+ degree days across much of the Central Valley. Overnight temperatures stayed well above average daytime highs in many places, and new all-time “warmest minimum” records were set. Quite a few coastal or near-coastal California cities matched or exceeded their all-time temperature records for any month–an impressive list that spans from the North Coast (Eureka) to the central coast (San Luis Obispo) and apparently even includes (amazingly) the Farallon Islands in the midst of California’s cold oceanic upwelling zone. Easily the most amazing statistic during this extraordinary event was the fall of downtown San Francisco’s all-time temperature record, where the observed 106 degrees surged past the previous hottest temperature (103) in 147 years of record keeping. It might not be a surprise, therefore, that summer 2017 was officially California’s hottest on record (and much of the Labor Day heatwave actually fell out outside of the formal June-August definition of “summer”). In fact, 2017 broke (by a considerable margin) the previous record set…just last year, in 2016. 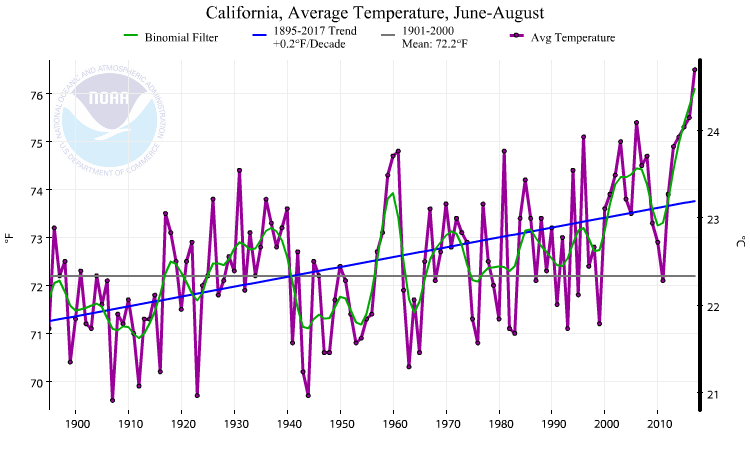 Indeed, this year once again puts an exclamation point on a sustained, long-term warming trend over the past century in California. Increasing frequency and intensity of extreme heatwaves is one of the clearest hallmarks of our warming climate, and it’s likely that “extreme” temperatures like those experienced this summer will become fairly routine in just a few decades. 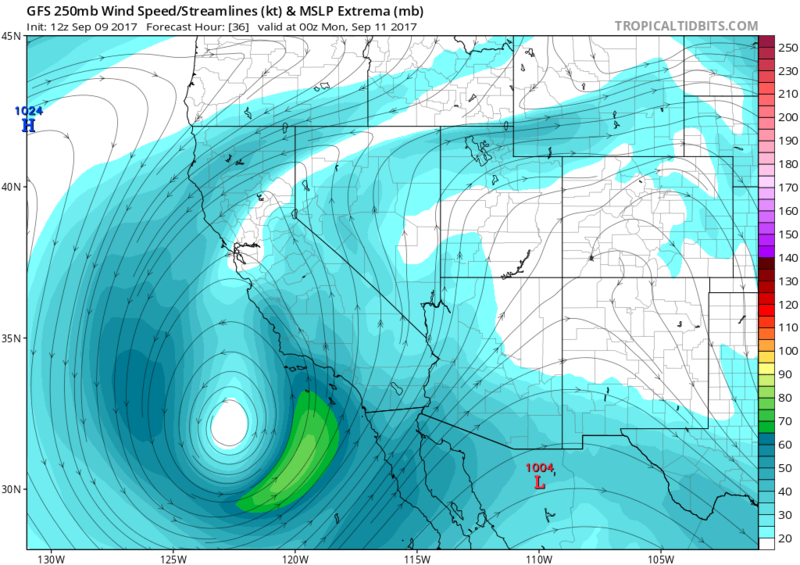 A slow-moving cut-off low pressure system is currently setting up shop off the Southern California coast, and has the potential to bring some very active weather to certain parts of the state over the next 5 days. Mountain and desert thunderstorms have already been quite active over the past few days, but beginning on Sunday convective development is likely much closer to (and perhaps including) the coast. In fact, convective parameters for late tomorrow afternoon for much of Southern California and the Central Coast are quite impressive, with able mid-level instability, sufficient column water vapor, and even some large-scale ascent forced by diffluent flow east of the offshore low. With all of these ingredients in place, numerous thunderstorms will likely develop over the mountains of Southern California tomorrow afternoon, at least a handful of which will sustain themselves as they move east to west over the coastal plain and even offshore. At least a few of these storms may be quite strong (or even severe), bringing intense downpours along with possible hail and gusty winds. This, tomorrow could be a pretty active weather day even in places that rarely see this kind of vigorous thunderstorm activity. There is at least a modest risk of flash flooding in interior areas hit by strong storms, and some localized issues could even occur outside of the mountains. It’s actually possible that thunderstorms may be more widespread tomorrow across portions of SoCal (including Los Angeles County) than they were during the recent “Lidia” tropical remnant event. (On a related note, if you haven’t checked out this video showing extraordinary webcam footage of the highly localized but quite damaging Santa Barbara microburst last week, you really should. Also, this one.). On Monday and Tuesday, the thunderstorm threat will shift northward to encompass most of the rest of California–even including the Bay Area and Central Valley. 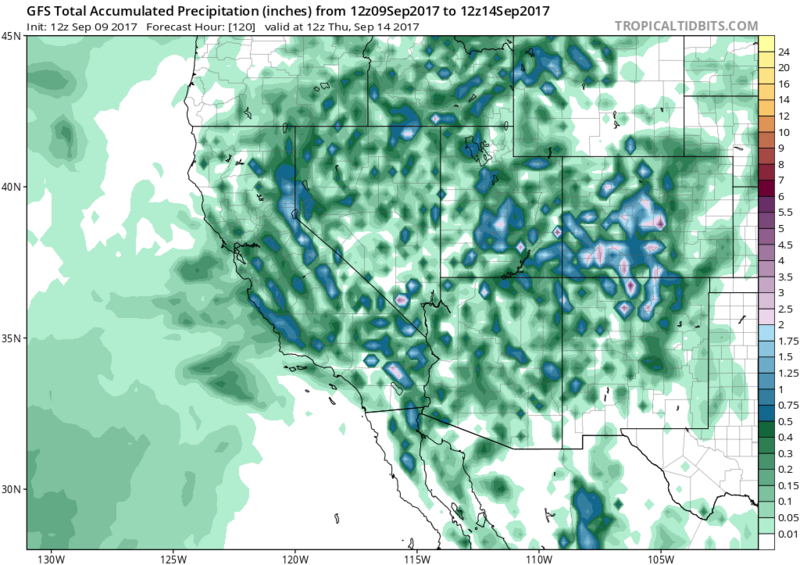 Scattered thunderstorms may ultimately occur uniformly over much of NorCal as moisture and instability will be present virtually everywhere. 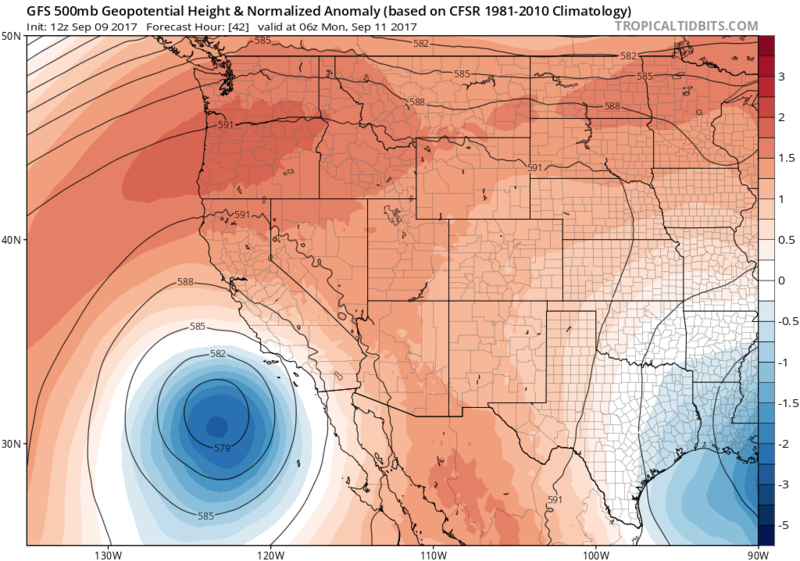 This sort of synoptic set-up–with a fairly deep offshore cut-off low and modest amounts of late monsoonal moisture–is reminiscent of the sort of pattern that has historically caused spectacular early autumn lightning displays over parts of California. Hopefully, this event will be associated with enough wetting rainfall to avoid numerous wildfire strikes, but given the time of year and the antecedent heat/dryness, this event will probably pose a significant fire weather threat. Later next week, the cut-off low will finally move inland and perhaps bring a final round of isolated showers and thunderstorms to a fairly broad area (perhaps even the coast), though coverage and intensity should be less than earlier in the week. After that, quieter weather conditions will likely return.